The Ulster Workers’ Council (UWC) issued a statement calling for an all-out stoppage to begin at midnight on Sunday 19 May 1974. The UWC criticised Merlyn Rees, then Secretary of Sate for Northern Ireland, for not meeting with leaders of the strike. Members of the Northern Ireland Executive were told that the Army could not run the power stations on their own. There were attempts at negotiation by the Northern Ireland Labour Party (NILP). Joseph Shaw (22), a member of the Ulster Volunteer Force (UVF), was shot dead by a member of the Ulster Defence Association (UDA) during a fracas in North Star Bar, North Queen Street, Belfast. The killing was part of a feud between the UDA and the UVF. District Council Elections Elections were held to the 26 district councils in Northern Ireland. As the United Ulster Unionist Council (UUUC) had broken up the main Unionist parties stood against each other for the first time since 1974. Two Royal Ulster Constabulary (RUC) officers were killed when the Irish Republican Army (IRA) exploded a land mine as their armoured patrol car travelled near Camlough, County Armagh. Two British Army (BA) soldiers were killed, and another died later as a result of injuries, after the IRA planted a booby trap bomb under their car in Enniskillen, County Fermanagh. The soldiers were off-duty at the time and had just competed in a fishing competition. Gavin McShane (17) and Shane McArdle (17), both Catholic civilians, were killed when the Ulster Volunteer Force (UVF) carried out a gun attack on people in a taxi depot on Lower English Street, Armagh. A joint delegation from the Ulster Unionist Party (UUP) and the Social Democratic and Labour Party (SDLP) held a meeting with John Major, then British Prime Minister, in London to discuss social and economic matters. Following the meeting the Northern Ireland Office (NIO) released a statement saying that Patrick Mayhew, then Secretary of State for Northern Ireland, would meet with Gerry Adams, then President of Sinn Féin (SF), informally when they were both in Washington on 24 May 1995 attending an investment conference on Northern Ireland. 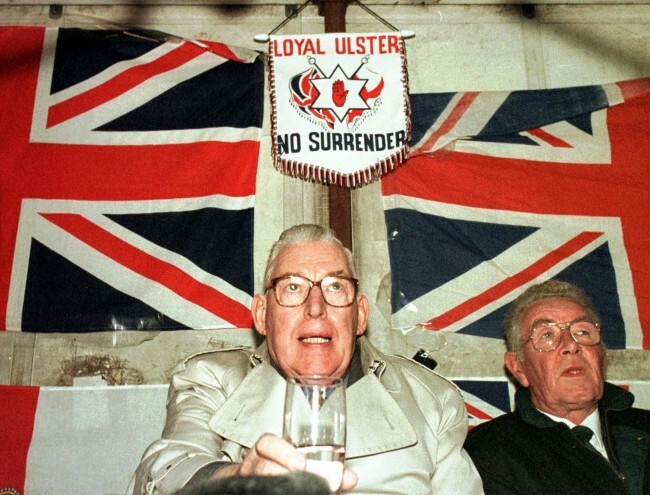 There was a Loyalist rally in Portadown, County Armagh, in support of Drumcree. Six Royal Ulster Constabulary (RUC) officers and six civilians were injured in disturbances at the rally. David Trimble, then leader of the Ulster Unionist Party (UUP), reiterated his party’s position on Irish Republican Army (IRA) decommissioning as Tony Blair, then British Prime Minister, called the main party leaders back to Downing Street, London. The Prime Minister was hoping to resolve the impasse which threatened the Good Friday Agreement. After the one-hour meeting, UUP party sources indicated that Trimble would propose that potential ministers in an Executive would be “identified”, though not “nominated”. There was a meeting of the Church of Ireland General Synod in Dublin. The General Synod voted to urge Drumcree church vestry to withdraw its invitation to the Orange Order to hold services at the church if the Order did not give assurances to respect Church sanctity and property. John Pickering (Rev), then rector of Drumcree, voted against each of the three motions that arose in respect of Drumcree. The General Synod voted to stop flying the Union flag on churches to avoid giving offence. Died three days after being shot by sniper while in Flax Street British Army (BA) base, Ardoyne, Belfast. Shot during attempted sniper attack on British Army (BA) foot patrol, Fairfield Street, Ardoyne, Belfast. Shot during fracas in North Star Bar, North Queen Street, Belfast. Ulster Defence Association (UDA) / Ulster Volunteer Force (UVF) feud. Killed in land mine attack on Royal Ulster Constabulary (RUC) armoured patrol car, Lislea, near Camlough, County Armagh. Off duty. Killed by booby trap bomb attached to his car, outside Lakeland Forum Leisure Centre, Enniskillen, County Fermanagh. Shot, while in taxi depot, Lower English Street, Armagh. Found beaten to death in entry, off Mount Vernon Walk, Mount Vernon, Belfast.